China released a slew of important economic data on the evening of Wednesday, Jan. 19, and markets were paying particular attention to China’s inflation. In order to put out the wild fire of inflation, China's central bank raised interest rates twice, and increased the reserve ratio for lenders four times in the span of just last two months. Those tightening measures have prompted great concerns about the major growth engine of the world. Partly on speculation (based on leaked information) that China’s inflation eased last month, emerging market stocks and the MSCI EM index climbed to its highest level in two and a half years just before the official data release. CPI Eased in Dec…You Say? The actual December Consumer Price Index (CPI) came in exactly as leaked—easing to 4.6% month-on-month from the 28-month high of 5.1% pace in November. 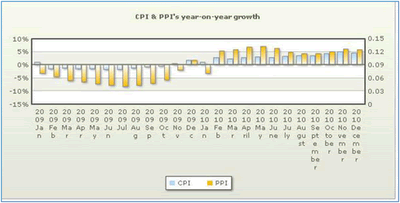 For the whole year, CPI grew 3.3% in 2010. China’s National Development and Reform Commission was quick to declare the government's effort to contain inflation has achieved initial, incremental success. However, instead of a rally, commodities sold off the morning after, and it is fairly easy to understand the market reaction since the official figures seem to defy economic common sense. First, let’s take a look at GDP, which is closely linked to inflation. China's economy surged 10.3% in 2010, and expanded 9.8% in the fourth quarter from a year earlier, faster than the third quarter's 9.6% growth. Inflation and growth typically comes hand in hand. With an accelerated growth in Q4, it is hard to digest that inflation actually went the opposite direction last month. Some attributed the easing in December CPI to lower food prices. The prices of food was up 7.2% year-on-year in 2010, just based on the official number. 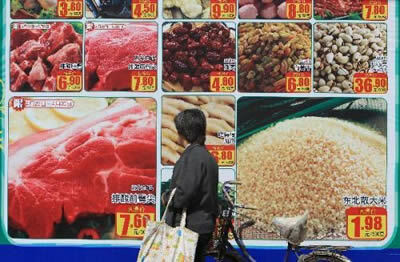 Meanwhile, various news reports indicate that the food price inflation in China is actually running in double digits, and the government had to release strategic grain reserves just to keep a lid on prices. Now, let's just take the 7.2% as the inflation number for food prices, which accounts for a third of the basket of goods in China's CPI calculation, and we know the price of housing, also a CPI component, rose 4.5% in 2010. So, in order to arrive at the final number of 3.3% overall inflation in 2010, the other two thirds of the CPI basket needs to yield a below 1.4% year-over-year increase. It is a challenge, to say the least, finding things that consumers typically buy with such moderate price increase--particularly in China--within this environment of QE excess liquidity, where every commodity seems to be hitting new highs every day. So, again, the 3.3% or the 4.6% CPI seems totally inconsistent with the undercurrents, which makes me suspect the real consumer inflation could be running as high as 6-7%... or more. Furthermore, the second measure of inflation--the Producer Price Index (PPI)--grew 5.5% year-on-year in 2010. Some numbers from the PPI-- raw materials, fuel and power rose 9.6% year-on-year in 2010, 9.5% year-on-year in December—suggest even more pain to surface in the CPI as early as Jan. 2011. China’s already battling a liquidity problem mostly from a surging money supply (M2 was up 53% over the past two years), record lending by state-owned banks and private lending, as well as foreign speculative hot money inflow. And contrary to the claim that the government anti-inflation measures are having its intended effect, the fact that China's four biggest State-owned commercial banks issued $240 billion Yuan new loan in just the first ten days of January has proven Beijing is fighting a losing battle. Now, in a bid to tighten the strong loan growth and risk controls, the China Banking Regulatory Commission said on its website that Chinese banks have been given until the end of this year to bring onto their books CNY1.66 trillion in off-balance sheet lending. This move will soak up some liquidity--up to CYN 324 billion--due to new higher reserve requirement, which is 19.5% for some of the biggest banks. But it could also bring about some kind of a banking crisis. Bigger banks most likely are sufficiently funded as some of them already went to the market last year, partly in anticipation of such a move by the central government. Smaller banks, on the other hand, may have funding difficulties. As such, the Chinese banking sector could become the unwilling victim in the fight against inflation. The Chinese government so far seems reluctant to use measures other than reserve requirement to cool inflation, as most of them tend to have even more undesirable consequences. For instance, raising interest rate could put more burden on some of the already highly indebted local governments, and further attracts hot money, while a Yuan revaluation would hurt China’s highly export-dependent economy. However, Beijing most likely will come to grip very soon that eventually somebody got to pay somewhere, and there’s just no way around it, and that the time has come for some decisive actions with a combination of more aggressive monetary, fiscal and regulatory measures to show it really means business. For example, instead of the symbolic two 25-bps interest rate hikes in Oct. and Dec., Beijing probably will do an immediate 50-bps rate hike by early February and another 50 bps in early March to blunt the start of the typical yearly run-up of crude oil, and other commodities. Then, depending on the market reaction and new economic data, more hikes could be implemented later on in the year. Fiscal policies such as taxes, and financial regulations and restrictions on speculative activities could be necessary. Meanwhile, the expectation of a Yuan appreciation is keeping liquidity swimming. So, perhaps China would do just the opposite, as suggested by Andy Xie, a currency depreciation, which would lead to a capital outflow forcing interest rates up. There many more things that China has to do to get the inflation situation under control, which most likely will send shock waves throughout global markets. Numbers may be rigged or "smoothed out", but can't fool the regular Chinese Joe's and the smart money. Chinese Premier Wen Jiabao was confronted with questions about inflation from callers during a visit to China National Radio in late December. Although he reassured the public about the government's ability to control inflation, it is nonetheless an early sign of social unrest and instability. I believe if China stays on its current "prudent course", the real consumer inflation could hit double digit by early next year. Inflation and widening wealth gap helped the Communist Party seize power from the KMT back in 1949. The same force could also break the ruling party some 60 years after. A slowdown now or a crash later....for global financial markets, neither offers a real happy ending. © 2011 Copyright Dian L. Chu - All Rights Reserved Disclaimer: The above is a matter of opinion provided for general information purposes only and is not intended as investment advice. Information and analysis above are derived from sources and utilising methods believed to be reliable, but we cannot accept responsibility for any losses you may incur as a result of this analysis. Individuals should consult with their personal financial advisors.